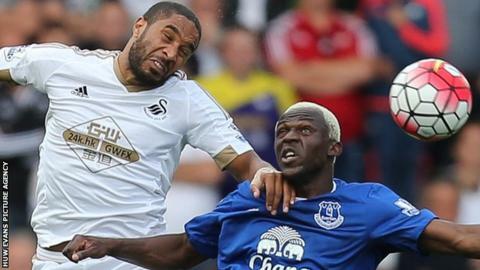 Swansea City's goalless draw with Everton was symbolic of the club's progress, says manager Garry Monk. The teams were evenly matched at Liberty Stadium on Saturday, with the point leaving Everton sixth in the Premier League and Swansea eighth. The Swans ended last season in that position - above Everton - and Monk believes their standing in relation to the Toffees is a sign of improvement. "I think that was a good marker to see where we're at," he said. "We more than matched them. I thought we were great. "That shows how far we've come as a club, the fact we're talking about Everton with all their history and the power they have in this league. "For us to feel we're on par and just as good as them... shows how far we've come as a team." Swansea had suffered their first defeat of the season in their previous outing which was a 1-0 loss at Watford. Monk was pleased his side reacted with an improved display against Everton, managed by former Swansea boss Roberto Martinez. "That was more us. We were at it," said Monk. "I spoke to the players to remind them that's what we're exactly about. "I thought it was a night and day performance compared to last week."